There's nothing more much needed than a good and REAL winter coat in the Northeast. Winters here are BRUTAL, as I am sure the majority of ya'll have heard. Not new news. 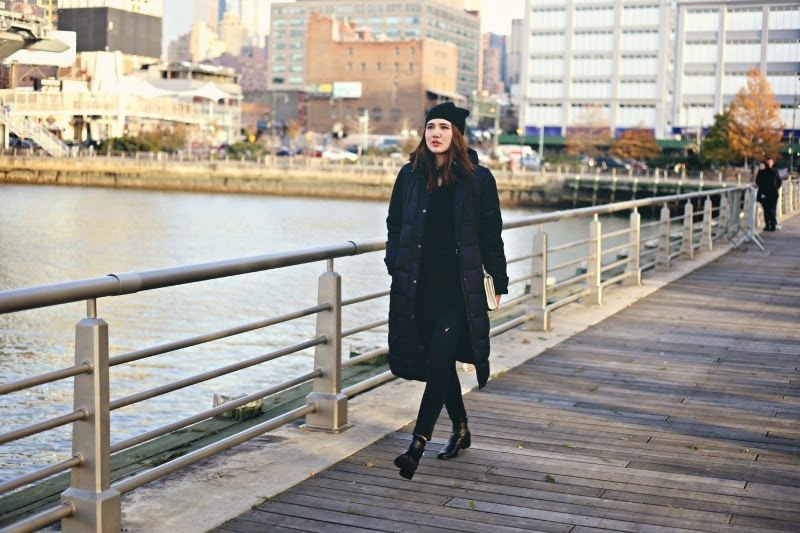 Freezing cold and trying and to look at least borderline chic is a tough cycle of a struggle each winter here. What's the point of looking cute when you have to cover it all up right? Well, problem solved thanks to Land's End. This puffer coat is my new best friend, and it's easy on the eyes thanks to its minimalistic nature and long, sleek lines. 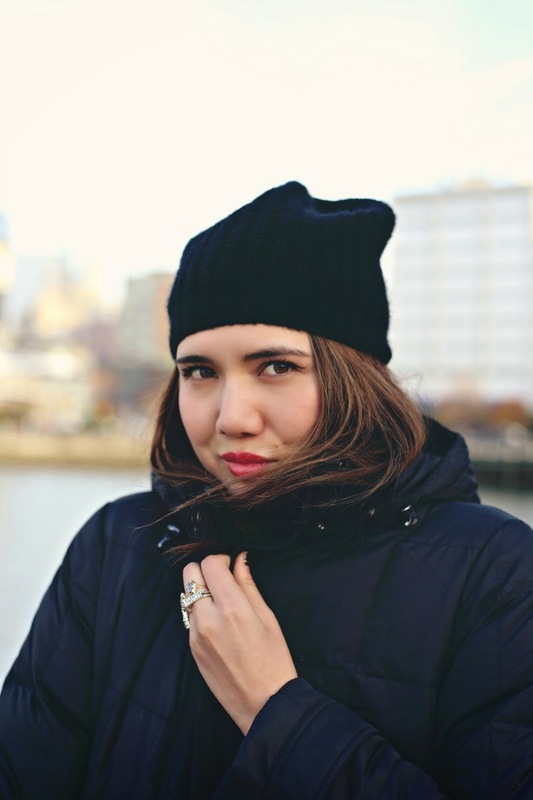 I've always snuck around wearing the puffer coat in the past to avoid getting lost in the homogenous tide of abominable snowman-esque winter gear that everyone else and their mamas sport in the wintertime. But this one feel different. I'm appreciating the art of its functionality (this baby has 600 fill power down to keep you extra toasty but not at all looking bulky) and the fact that it doesn't actually take away from what I'm wearing underneath despite its quilting. I wouldn't even mind throwing this baby over a sparkly party dress for New Year's Eve if it's going to save my body temperature from dipping too low. I went all black here, with a touch of grace from this lovely little clutch. I finally have figured out the key to unlocking the secrets of the fashionable puffer jacket. Long length to balance out the volume. Subtle quilting. And all black baby. Cool jacket, and yeah, if it's freezing outside the only thing matters is to find a coat what keeps you warm and if it's even stylish..well,is just the cherry on the top! Looking very stylish even when bundled up! Very cool all black look Dylana! always love the puff coat simple and so chic !! OMG you look so good and you sure style it perfectly simple with ripped jeans and love your amazing eyebrows such a beauty!! What can I say except love love so much the beanie and the coat!! 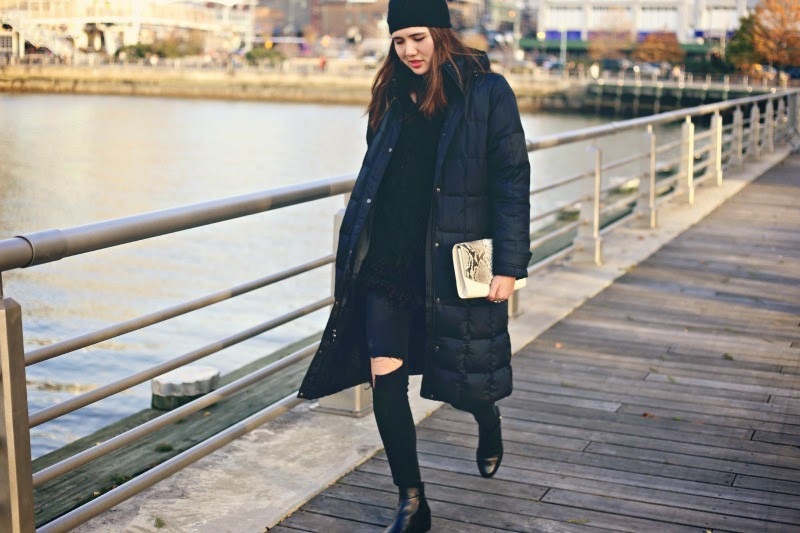 I love how you styled this puffer coat! I've always had a thing against puffer coats because I cannot pull them off for the life of me, but I think I'm going to give it one more try! 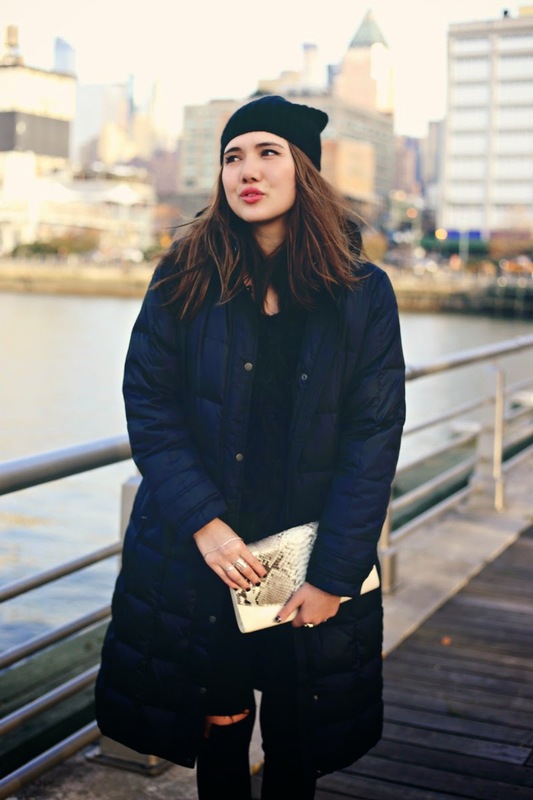 You are gorgeous and love the puffy coat , you make it so chic ! !